The church has a quite remarkable suite of large stained glass windows comprising the Sacramental Window in the East, the King Robert the Bruce Memorial Window in the North transept and the Malcolm and Margaret Window in the South transept. The Sacramental Window is positioned at the Eastern end of the church, and has a classic presentation of the Last Supper in which two of the faces of the apostles are the faces of the brothers to whom the window is a memorial. It was a stipulation that their identification should remain a secret. This great window rises behind the pulpit so that from the pew, the eye travels from Communion Table to Pulpit to Window. The combination provides a splendid and inspiring declaration of Word and Sacrament in carved wood, stone and stained glass. 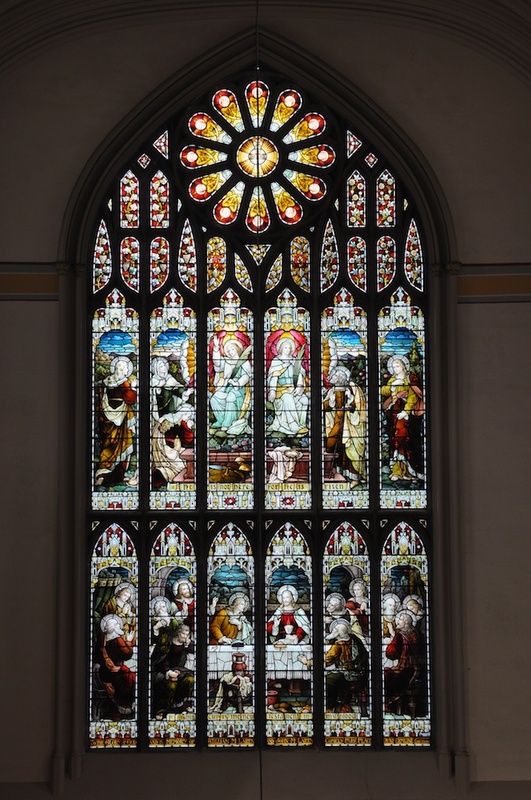 In the North transept is the “The Bruce Window” . Dedicated in his memory on 7th July 1974 which was the 700th anniversary of his birth. The upper lights represent the spiritual estate with Christ in Glory in the centre. The lower lights representing the mortal estate with King Robert the Bruce in the centre with the point of his great sword at rest between his feet. The centre quatrefoil of the tracery depicts the Lamb of God. This is surrounded by the symbols of the twelve Apostles.